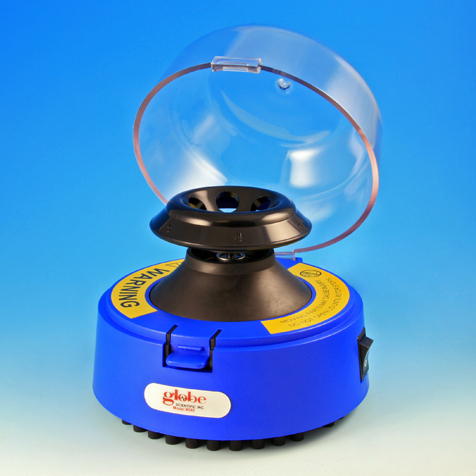 Globe’s mini centrifuge is perfect for quick spin-downs of small samples. It comes standard with a six-place angle rotor for 1.5mL to 2mL microcentrifuge tubes, six tube adapters for 0.5mL tubes and a separate rotor for sixteen 0.2mL PCR tubes or 2 PCR strips. Each rotor can be easily interchanged by the user in a matter of seconds. The crystal clear lid allows the operator to safely observe samples. A special safety shutoff system cuts the motor as soon as the lid is opened. The centrifuge is small but mighty. It quickly accelerates to a maximum speed of 6,600 rpm (2,200 rcf) and stops within seconds. The motor provides a super quiet, vibration-free operation.